Garston is a village in Hertfordshire, England. 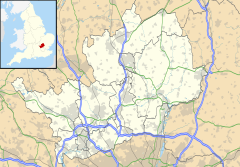 Garston is contiguous with Watford and now, despite retaining a local identity, is effectively a suburb. It is within the Stanborough, Woodside and Meriden wards of the borough of Watford, although a small number of its streets are in Hertsmere. The Building Research Establishment has its headquarters within Garston. Garston has several large secondary schools including St Michael's Catholic High School, Parmiter's School and Francis Combe Academy. Garston railway station on the Abbey line is served by West Midlands Trains services. Arriva London operate a bus garage in Garston. It is scheduled to close in 2018. ^ Ordnance Survey: Landranger map sheet 166 Luton & Hertford (Hitchin & St Albans) (Map). Ordnance Survey. 2012. ISBN 9780319232095. Wikimedia Commons has media related to Garston. This page was last edited on 12 May 2018, at 08:13 (UTC).